At Evergreen & Gold Renewable Energy our passion is the environment. Climate change is an issue that cannot be ignored. 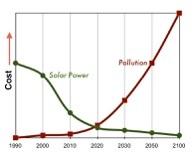 Solar power is an excellent and affordable solution to provide non-polluting carbon-free power. Alberta is one of the best places on Earth for solar power. In North America electricity production is one of the largest producers of the green house gasses that are changing our climate. In Alberta 80% of our electricity generation comes from coal and natural gas, which are major sources of green house gasses and toxic by-products. Alberta burns over half of all the coal burned in Canada for generating electricity. Our decision to start a solar energy business stems from a real desire to reduce climate change. Drop by at 4508 121 avenue to see our solar powered office. Copyright © 2010 - 2013 Evergreen and Gold Renewable Energy Inc.